Syrian opposition commanders from across the country have joined forces under a unified command to enhance coordination among diverse rebel groups fighting to topple President Bashar al-Assad. More than 500 delegates representing most of the brigades involved in the fighting had been meeting since Wednesday in the Turkish resort of Antalya to form a united rebel front. By Saturday, they announced the election of a 30-member Unified Military Council and a Chief of Staff. The delegates chose Brig. Gen. Salim Idriss, who defected from Assad's army last March, as the chief of staff. They also divided Syria into five regions, each of which will be under one of Idriss' assistants. A civilian to handle non-military affairs will second each of the assistants. The new structure includes high-ranking officers as well as important on-the-ground commanders. Among them are Brig. Gen. Ziad Fahd, Brig. 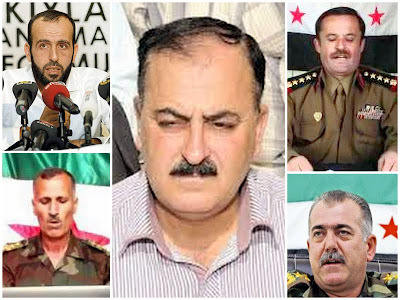 Gen. Abdelkader Saleh, Col. Abdeljabbar Akidi, Col. Mustafa Abdelkareem, Jamal Maarouf, Ahmad Issa and Abdelbaset Taweel. Extremist rebel groups -- chiefly the al-Qaeda-inspired Jabhat al-Nusra -- were excluded from the huddle in Antalya. The Military Council will work hand in glove with the political leadership chosen in Doha last month – namely, the Syrian National Coalition of Revolutionary and Opposition Forces headed by Ahmed Moaz el-Khatib. The move toward greater unity on the armed front comes as the U.S. and the West try to prod the National Coalition to have broader political representation and stronger links to rebel fighters. The U.S. and others are expected to recognize it at an international "Friends of Syria" conference in Marrakesh, Morocco, that begins on Wednesday, December 12. National Coalition chief Khatib called Saturday for talks between all anti-regime groups to hold talks to form a transitional government. In a televised speech, he said the National Coalition does not seek public office and that it would disband once free elections are held in the new Syria. Khatib said talks were also underway to form a judiciary to be put in place immediately after the overthrow of Assad's regime to avoid chaos. He urged all Syrians – “whether military or civilian, Muslim or Christian, Alawite or Druze, Arab or Kurd, Ismaili or Assyrian” – to remain inseparable and ward off any Syria partition plan.